AAT is a protein produced in the liver which subsequently reaches the bloodstream. Along with inactivating numerous proteins, AAT is responsible in particular for protecting the lungs from neutrophil elastase. This enzyme is responsible for the non-specific breakdown of exogenous proteins during the immune response. If elastase activity is not stopped by AAT, lung tissue is destroyed by the unchecked effect of the enzyme. Because of changes within the AAT gene, release from the liver cells into the bloodstream is disrupted. On the one hand, this leads to the accumulation of AAT in the liver cells. On the other hand, this leads to AAT deficiency in the lungs and, due to the destructive effect of elastase, to severe damage, for example, in the form of chronic obstructive bronchitis. The most frequent defect type for an AAT deficiency in the lungs is a mutation that leads to the so-called Z phenotype. In homozygote carriers, this is accompanied by a significantly reduced AAT level in the lungs. Along with this mutation, there is yet another change that leads to the S phenotype. A combination of the S and Z phenotype likewise causes an AAT deficiency. An examination should be performed above all for patients under age 40 with chronic cough or shortness of breath. Our GenoType AAT test system enables you to detect both mutations leading to the Z or S phenotype possible, and thus the genetic base of AAT deficiency in the lungs. No limitation: since AAT is an acute phase protein, the concentration in the blood and lungs may vary greatly. For this reason, biochemical methods may indeed document the present situation, but may not necessarily recognise a long-term AAT deficiency. Testing the genetic basis is therefore meaningful and recommended. 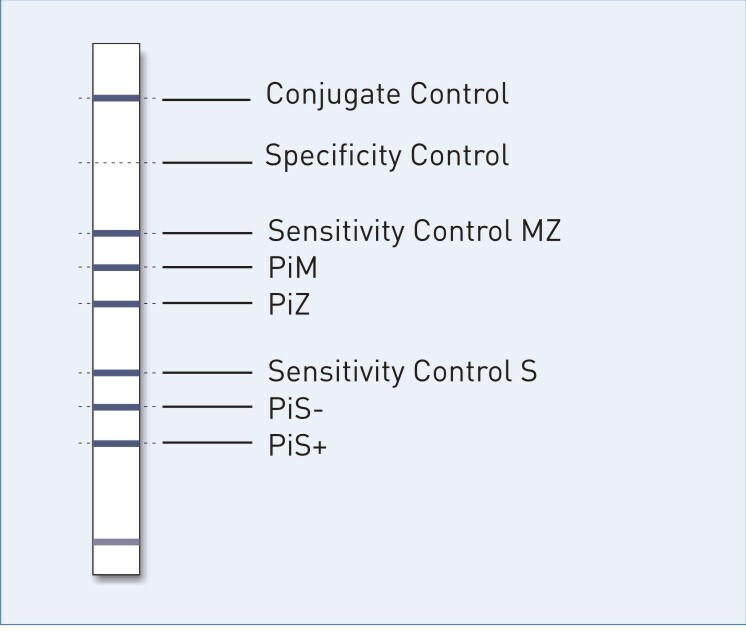 Simple evaluation: changes in the AAT gene are shown on the test strip. Evaluation is done using an evaluation template; an interpretation table shows the associated phenotype. Definite result: if the test is not processed under optimal conditions, this will be indicated by an internal control.